A busy agribusiness storage facility in the heart of Ontario’s feed production zone is saving time and money with a powerful pneumatic railcar opener, expediting the opening and closing of stubborn railcar gates while reducing the risk of injury. The versatile design features an adjustable capstan and handle to compensate for variations in cars, unloading platforms and operator preferences, with pivoting wheels to facilitate manoeuvring in tight locations. It delivers 2,700 pounds of torque at 90PSI to open even the toughest gates efficiently, without excessive manual labor or damage to cars. Seaforth Elevators and Expediting specializes in storing and shipping agricultural products such as grain, seed, micronutrients and by-products. The company maintains three main receiving elevators, with two serving truck and rail lines and one dedicated to trucks. Although throughput is seasonal, the facility averages more than ten rail cars per month, with the tallest elevator capable of receiving as much as 5,000 bushels per hour. Railcars are typically unloaded in about three hours, with contents destined for packaging, storage in silos or bins, or loaded directly from railcar to truck. 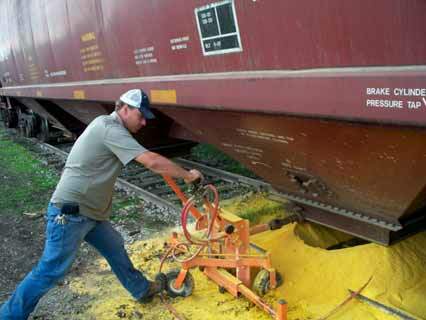 The Martin Railcar Gate Opener is built on a wheeled carriage that can be positioned by one worker, and its 10"x4" pneumatic wheels manoeuvre easily over rough rail side conditions. The unit delivers smooth, non-impacting force to open gates without damage, and the heavy-duty construction delivers a long service life under real-world service conditions. Engineered to operate on 90–120PSI of compressed air (6.2 to 8.2 bar), the design consumes 18.5–20.5 CFM (8.7 to 9.7 litres/second) during normal use. Seaforth employs a twin piston compressor with a 100-gallon tank. Seaforth Elevators and Expediting is a family-owned and operated business, including two facilities specializing in loading/unloading, storage and product packaging. With more than 2,500 metric tonnes of storage available, the company is located on a well-maintained daily short rail line, near major border crossings and highways. The rail siding from the Goderich/Exeter Rail Line can handle up to five cars at a time, and flexible storage options include bin capacities from 15–500 metric tonnes. Martin® Vibration Systems & Solutions is a major innovator and supplier of rail car accessories, industrial vibrators, compaction tables, feeders, hoppers and other material handling products for a wide range of industries, including chemicals, food, pharmaceuticals and foundries. The firm supplies both electric and pneumatic models. MVS has built its reputation on developing quiet and energy-efficient designs, engineered and built to deliver precise energy transmission, long service life and low maintenance.